In Part 1 of Female Pharaohs: Women Who Ruled Over Egypt, we took a look at the Pharaohs Sobekneferu and Hatshepsut, two women seized power after the deaths of their ruling husbands. Sobekneferu and Hatshepsut are two female pharaohs we know of for certain; it’s hard to pinpoint without a doubt because ruling women often took on the traditional male trappings of power, including male clothing, crowns, poses, and even false beards. Now in Part Two we’ll take a look at two more female Pharaohs: Twosret and Nefertiti. The last ruler of the 19th Dynasty of Ancient Egypt was another female pharaoh named Twosret. 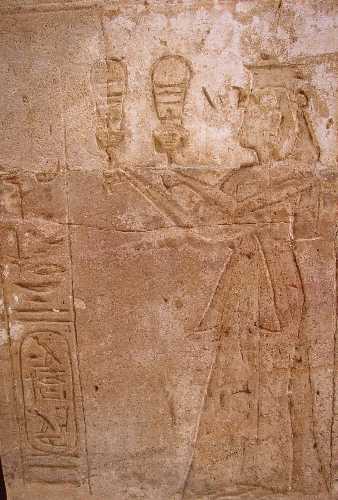 Originally the second royal wife of Seti II, she began acting as regent for his son, Saptah, when Seti II died after a short reign of six years. Saptah was still a young child when his father the King died, and he suffered from health problems including an atrophied leg. Twosret became co-regent for him, alongside Chancellor Bay, an advisor to the late king. Chancellor Bay was executed for treason on Saptah’s orders within a few years of his official reign, leaving Twosret as sole regent. Saptah himself died soon after, and Twosret officially took on the role of Pharaoh. Taking the royal name Sitre Meryamun, meaning “Daughter of Re, beloved of Amun,” she ruled Egypt for six years before she was overthrown during a civil war, marking the end of the 19th Dynasty. The famous Nefertiti was the Great Royal Wife of King Akhenaten, but her role in Ancient Egyptian history didn’t end there. King Akhenaten showed his wife unprecedented respect and admiration, making her his co-regent. Some scholars even believe she took over as Pharaoh in the years after his death. Nefertiti never claimed royal lineage and was probably the daughter of an army officer. A devoutly religious worshipper of the “one true god” Aten, she also served as a high priest. In fact, her reign alongside Akhenaten is most famous for ushering in a monotheistic age in Ancient Egypt with their devotion to the deity Aten, who they praised as the creator and giver of life. Some scholars suggest that it was Nefertiti’s devotion to the god that sparked Akhenaten’s interest and their quest to turn Egypt to a monotheistic kingdom. Akhenaten’s devotion to his wife is obvious in the relics left from their reign: Instead of having the traditional depictions of female deities like Isis or Neith carved into his sarcophagus, he had his wife’s image carved there instead. The royal pair is depicted together as a happy married couple in reliefs that show them kissing in public, sometimes with Nefertiti sitting on his knee. What makes Katherine Swynford such an intriguing subject?